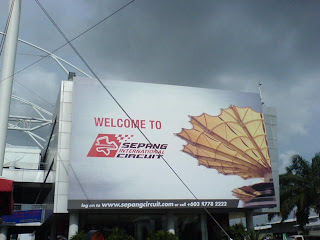 It just so happen that Mr Daniel Teh had some complimentary tickets to catch the F1 at Sepang on Sunday! and since he got excess tickets, he asked me to go and, why not?? It's like sum kinda once in a lifetime experience. So we- including his sister and her boyfriend- left at around 2.45pm. Thanks to the goddamned jam we're late and we missed the missed the start of the race. Damn. 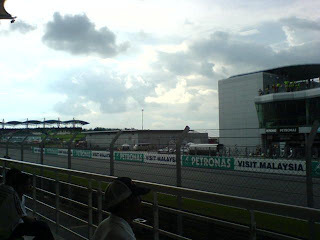 But our seats are located at one of the best place, along to long stretch at the starting grid, directly across the pit stop. Seriously, you've gotta have earplugs especially when you're sitting at the place where the cars travel at their fastest speed. It's like your eardrums will break if you don't. Soon, the sky turned dark and lightnings constantly striking. 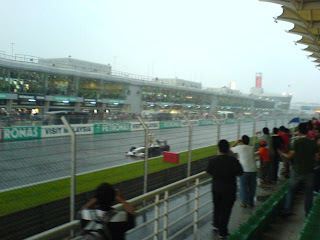 The cars started to change to wet tyres. 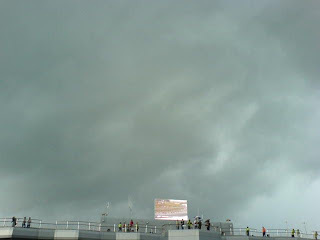 And, as expected, it started to rain heavily. 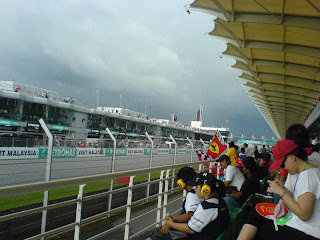 Soon, red flag is waved, indicating race to be stopped until the rain recedes. 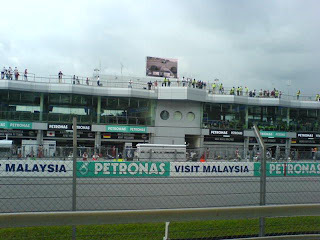 Then the race would be restarted.- Or, supposedly to be like that. 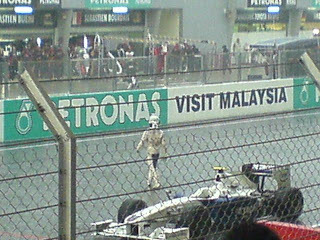 BMW Sauber's Nick Heidfeld is the first who stopped along the starting grid. 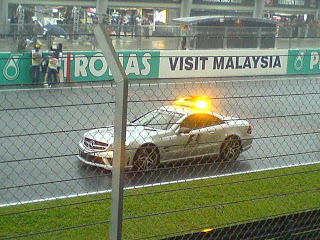 The safety car is soon deployed. 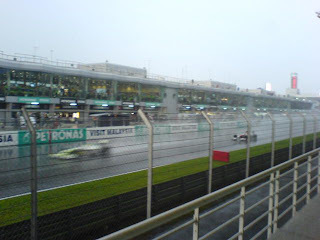 Then, as the rain come to a stop, as every driving got ready and into their cars, suddenly it was announced that the race will be suspended and will not be restarted- probably because it's already 6.52pm at that time, and if it does continue, it will more lilely become a night race. 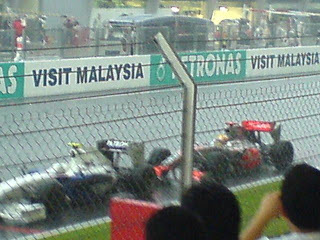 In the end, Jenson Button won it by half points. 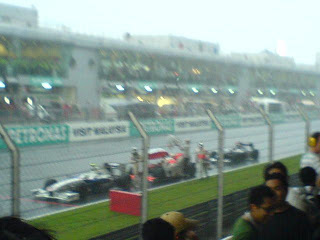 Therefore it's the end of a dramatic race and a quite dissapointing one for the spectators. hey. guess what. 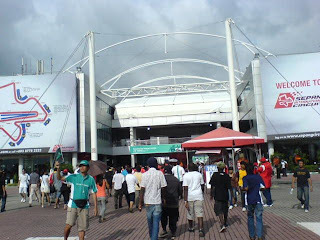 I WAS THERE TOO! in st.john uniform. didn't saw me ? haha. 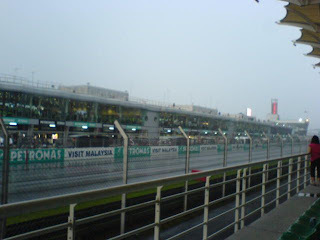 anyway, dat race was nice at first until the rain pour down. haha, i wan been there oso. 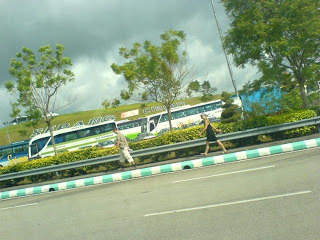 next time got extra ticket just call me out la,hehe. Full name is (or formerly known as) Lum Wing Tatt... Lucas or Luke is actually created not very long ago...you can say that it's a self-proclaimed English name. Just turned 18 this year. A Chinese but a banana. Currently studyin at TAR College. Tat's briefly me!